Sniper Ghost Warrior 3 is a fun game with some design problems and technical issues. This mod aims to improve the game as much as possible. Just want bug fixes? The Unofficial Patch is for you. Want a leaner, meaner, more focused version of the game? Then give the Improvement Project a try. SGW3 undercuts its resource economy in multiple ways, which I have attempted to address in the Improvement Project. In the vanilla game, you are not allowed to run out of pistol ammo. If you return to your safehouse and have less than 20 bullets, the game will top you up to a minimum of 20 bullets. Fixed by removing the minimum values for various ammo types. Now you can actually run out of ammo. Or you could just press F to refill all your ammo and gadgets for a moderate fee. Why explore the world? Why care about how many bullets you have left? Just press F whenever you return to your safehouse to make more bullets appear like magic. It's not like you're ever gonna run out of money, either. The game gives you ludicrous quantities of money. Every NPC you loot is carrying that sweet plastic/paper. 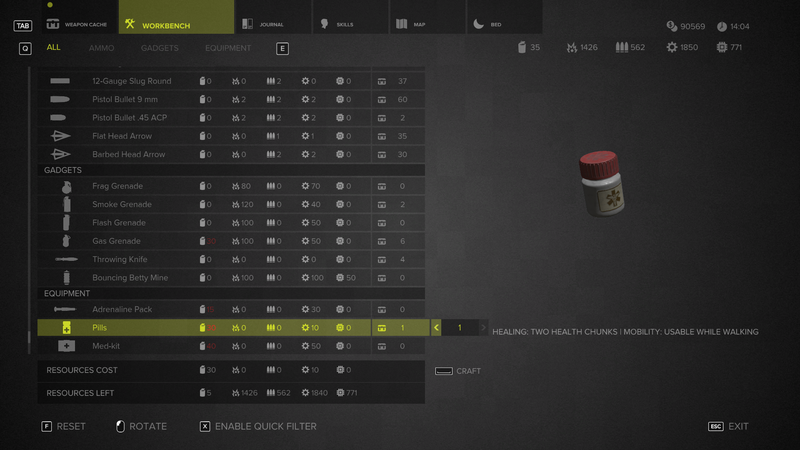 Fixed by removing the ability to buy bullets, gadgets, and medical supplies using money. You want some pills? You better hope you find them when looting a body, or you'll be forced to victimize the wildlife for raw ingredients. Either way, someone (or something)'s gotta die. In the vanilla game, you can't carry many items. This causes some major problems with not being able to stock up on resources properly. As a stopgap measure I have dramatically increased the quantity of bullets and items that the player can carry. This is a compromise driven by the fact I can't realistically change how the game's inventory system works since I don't have access to the C++ code. I can't even change the behavior where your character picks up guns if you have the same type of gun in your possession. What I have done, however, is reduce looting drop rates and the quantities of ammo found in NPC dropped weapons. Instead of being able to get 100+ bullets just by shooting a few guys and stealing their guns, you now get something like 10-20 bullets instead. One problem is that game tends to give the player money after they die. This is perhaps a failsafe to stop players running out of money. But it means that trying to constrain the player through monetary prices is useless. The only reasonably way to constrain the player is through crafting resources and drop rates. It's my hope that these changes will significantly improve how the game feels to play. Creating more tension. Creating an incentive to explore the world, loot, and generally manage the usage of the resources on your person instead of taking them for granted. Finally crushed an irritating bug that made SGW3's laser sights render inconsistently. There are lots of changes this month, including a superior fix for the time of day problem, bug fixes, and wheels. Lots of wheels. Fixing the radio, for real this time. Plus other fixes. The broken car radio in SGW3 is one of those little bugs that has eaten away at me ever since I first played the game. I finally found a solution. What's new in SGW3: IP/UP 0.44? This combined installer-based version of the mod replaces the previously separate distributions of UP/IP. Read the install instructions for more. When installing, if I want everything from both the Unofficial Patch and Improvement Project, what would I choose, the custom installation, or first install UP, then re-launch the installer and install IP? Got it installed alright I think, I did the custom install with UP first, then what I wanted of IP's features. I'm playing without that set of features since they're all tied together, and god is it annoying only being able to carry 40 or so extra rounds max for your AR. - "Sidearms and secondary weapons more responsive ADS from a sprint." - "Fixed strange torso damage multiplier"
- "Vehicle tires can be shot out, affecting handling." I ran into a bug with the new driveable vehicles. This vehicle at the Satellite Dish area is driveable: Imgur.com But once you get in you can't get out lol. One final thing (sorry for typing up so much! ), is it UP or IP that's disabling the Bullet Cam? I kinda like it, but since I installed UP I'm no longer getting it..
hi, does it include CustomMod_1.1 or work in synergy? I really appreciate your work. Thx mate. Please! How can I return standard limits for carryind ammo and items? I'm carrying ammo for whole army, and meds to open a hospital! This is ridiculous, man! You can install the custom version without the resource overhauls if you're not fond of the system. The intent was to constrain the player via resources, not via weirdly low ammo and resource capacity limits. If the player wants to hunt a bunch of animals and craft a dozen medkits, why not? I may lower the limits a bit. Thanx! I overlooked the custom install, will try that. when you throw like a stone the screen shakes you have any solution? It's mentioned in the readme, but don't holster the weapon and then change the weapon. Hold the holster button again to unholster. Otherwise it causes problems. 1. When I press aiming it's quite often that John starts to shot. That makes stealth quite impossible. 2. Every time I play Rotki Lions 2 and infiltrate the hotel, the scientist has no keycard. So I can't complete the mission Is there any help on it's way? I'm afraid I have no idea why your gun would fire when you aim. I do recall some CryEngine games having a weird issue where guns randomly fire, but it only happens on certain hardware and I don't know the details. I don't know anything about this keycard issue. Could you explain the problem in a bit more detail? I can't remember how that particular NPC works. (It's possibly a regression caused by the mod, but I'm not sure.) Has it happened repeatedly? Now, I've played the game in with the mod for the second time, just to look if it's the same problem. In "rotki Lions II" you have to infiltrate the hotel and find out, where the scientist is. after that you need to kill him, because he has the Keycard. With killing him you get the card wich you need to open a door to finish the mission. He does nothing, I think he doesn't even speak. And before installing the mod I haven't had this problem. Could you possibly upload your save game files so I can test that mission? They should be inside C:\Users\[Your Account Name]\Saved Games\Sniper Ghost Warrior 3 inside a folder called SaveGames. Just put that folder inside a rar or zip file and upload them using any service of your choice. Even Google Drive or something like that would be fine. I am so sorry. As you know, there are two ways to interact with a KI. You can kill him, or you can interrogate him. I've killed the scientist a few times and did not get the card. Today I just walked around him (he could see me the whole time) and interrogated him, what also killed him by the way. That's how to get the damn card! I am really sorry. After playing this game way more than 200 hours I should not forget this kind of details. No I will remember I think. Out of curiosity, though, does that mean that killing him instead of interrogating him breaks the game? Yes it does! And that's where I thought it's a problem caused by the mod. But it isn't. The thing is, that every time you interrogate somebody it ends with killing him. You hve to interrogate him, thn John says: Give me that f.....ing keycard. After the scientist has done that, John kills him.